Yes, it’s the middle of winter right now, but what better time to start planning an outdoor kitchen installation on top of brand new Tufdek vinyl decking. If you’re already planning a reno to a vinyl patio, deck, or sundeck, then adding a few amenities to a vinyl deck or vinyl patio can make all the difference between a mere barbecue space and one that you can fully prepare and enjoy a meal with friends and family. There are a few benefits to installing a kitchen on your vinyl deck or other outdoor areas. For one, it lets you spend more time outside. It keeps the heat of cooking outdoors so your home is cooler and you spend fewer resources or cooling your home. Cleanup is easier when you include the ability to rinse or wash dishes, and you can spend more time visiting with friends when you don’t have to continually duck inside for items or to prepare food. The main feature of any outdoor kitchen is the cooking surface. Grills come in all shapes and sizes, with various features like side burners, rotisseries, searing plates, etc. You can also consider installing a separate cooking surface (like an outdoor stove) and oven. It all comes down to your budget and what you think you’ll use regularly over the long term. Don’t pay extra for something you won’t use, but at the same time don’t cut out items that could be useful. Having an area to prepare food in your outdoor kitchen can make all the difference between an outdoor kitchen that you use on occasion, and one that you find indispensable. Evaluate the space that you have and decide whether it’s worthwhile to include some counter space for meal preparation. Including a small sink can make a huge difference as well – it lets you rinse food and dishes so clean up is a breeze. If you do not include enough preparation space on your vinyl deck, you’ll find it frustrating to prepare food and will end up back in the kitchen! One thing we rarely think about with outdoor kitchens is where everything will go – pots, pans, cutlery, knives, cutting boards, barbecue tongs, etc. Rather than constantly bringing supplies in and out of the house, include some outdoor storage in your plans, as well as a budget for outdoor kitchen supplies. Don’t forget to make use of wall space, it can provide an easy location for shelves or hooks for pots and pans, as well as cutlery and plates. Previously, an outdoor kitchen could only go on an upper deck – as wood decks would let water and debris through, making having the deck on a ground floor patio unpractical. 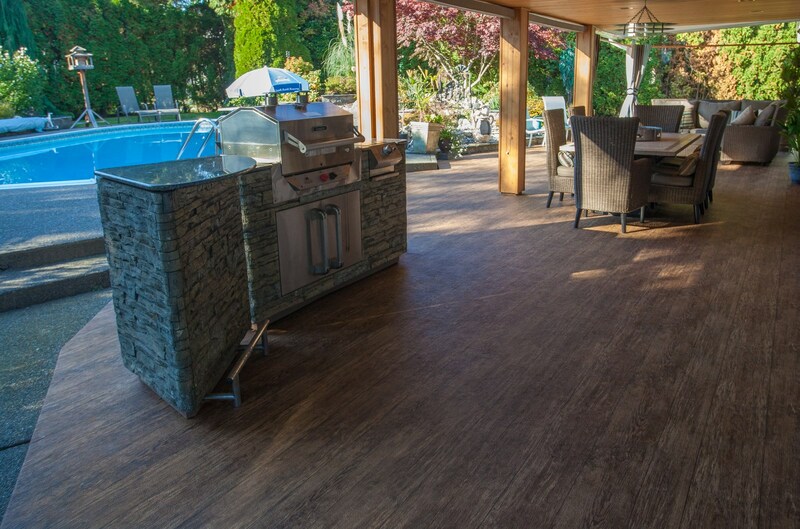 With Tufdek Waterproof Vinyl Decking, you can make the space underneath your deck completely waterproof, which provides you with a year-round, covered space to install your outdoor kitchen. 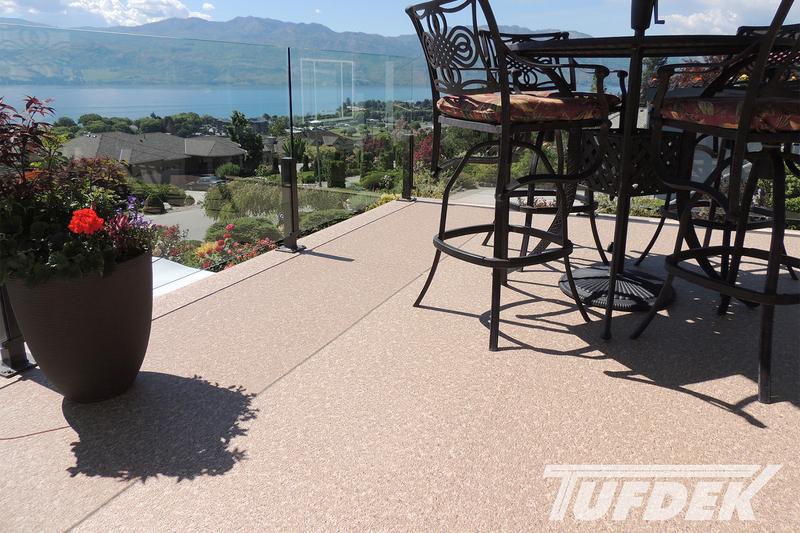 You can even install Tufdek Vinyl Decking on a ground floor patio to make a cozier living space. For top-floor vinyl decks or vinyl roof decks, you might want to consider a deck cover so you can use your outdoor kitchen, rain or shine. After all, you’re making a major investment in an outdoor kitchen – why not make sure you can get the most out of it? Either way, select your outdoor kitchen location based on your main entertainment area, as you don’t want to have to remove yourself from the fun of mingling when it’s time to prepare the food! The best way to get a great outdoor kitchen on your vinyl deck or patio is to have someone work with you who knows what they are doing. A Tufdek™ contractor knows how to install vinyl deck surfaces that will provide your outdoor kitchen and your deck or patio with the toughest protection, as well as to help plan the best outdoor kitchen possible. 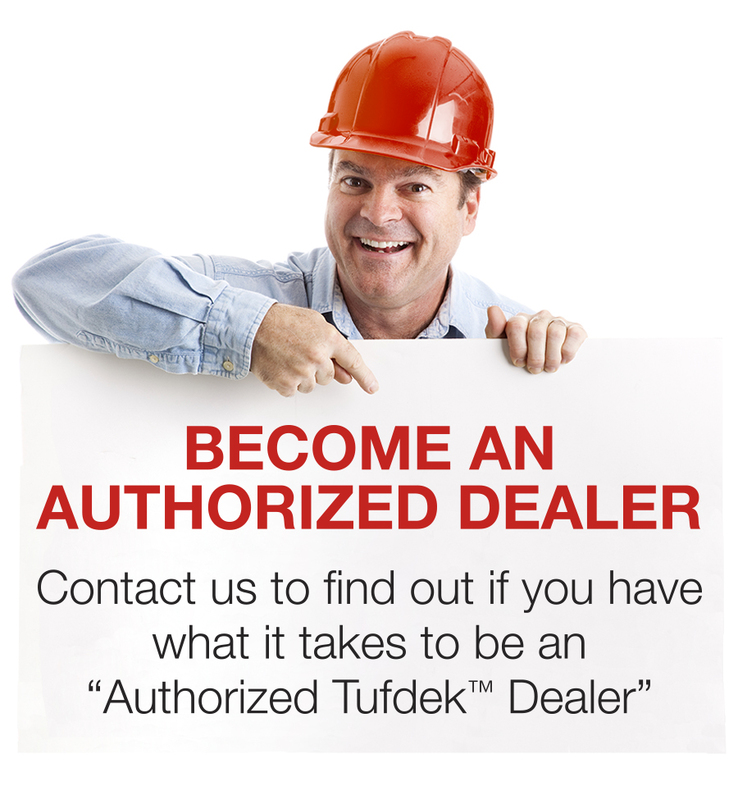 Tufdek™ Customer Reviews from Tuff Industries Inc. on Vimeo.